Brace yourselves; winter is coming. I always wanted to say that. No, but seriously… winter really is coming at the time of writing. Days are getting shorter. And that means it’s becoming more and more important to bring good lighting with you, if you intend to hit the trail in the cold months. Recently, I got my hands on two Foxelli MX500 headlights. One black, one white. They have slightly different model numbers: MX500L and MX500B respectively. But they are identical, save for the color. I got two because I like to drag my girlfriend along on a hiking trail from time to time. I take the black one. She gets the white one. Read on to learn all about my findings! Let’s start with the most important thing about a headlight: it’s ability to provide you with light, while being worn on your head. The headlight has multiple lighting modes. They are all accessible with a single button. The Foxelli MX500 only has one button, and it’s easy to use. You can cycle through the various lighting modes by pressing the button repeatedly or, in the case of SOS mode, keeping it pressed for 1.5 seconds. Press for 1.5 seconds for SOS mode. By quickly pressing the button (and with quickly I mean: don’t delay), you cycle through these lighting modes. Leaving the button unpressed for a little while, will take the headlight outs of its lighting mode cycling. Spend a few seconds in any one lighting mode and pressing the button again, will turn the light back off. That’s a good thing, because it means you can turn off the headlight with a single press of the button, no matter which lighting mode you are in. Although I had some trouble figuring out how it worked, it’s extremely user friendly once you’ve gotten the hang of it. The reason why it took me a while to figure out, is because there is no manual included with the MX500. I had to mail the company and ask them how it worked in order to figure it out. The reason why the lighting modes are ordered like that, is because the lighting modes that you are most likely to use are the ones that are placed early in the cycle. The ‘average’ and ‘bright’ modes are good enough for most people under most conditions. It’s possible you’ll want to switch to ‘minimum’ or ‘ultra bright’, but then you’ll simply have to press the button an additional 1 or 2 times, depending on which one you want. While average and bright will be in use most often, there can definitely be circumstances where you’d want to go with either minimum or ultra bright. Minimum doesn’t give a lot of light, but saves a lot of battery. You could turn this on when you are hiking very early in the morning, right before the sun is about to come up. The ultra bright, then, could be used in circumstances where it is truly pitch dark. For example, when you are hiking in the middle of the night, or you are exploring a cave or something. When screwing around with the lighing modes upon receiving them, I looked too directly into them. Not exactly directly, but more like sideways… just to get a feel for how bright they were. Well, I found out. For minutes after, I had some serious halos in my vision. Do not look directly into these lights for too long! They really are super bright. Don’t point them at your eyes or anyone else’s. Point them at a dark area instead. I guarantee you… you’ll be happy you did! The Foxelli MX500 has a retractable light dispersion cap, that you can either open or close. When you open it, light isn’t dispersed, but focused. You’ll have a small beam of light, that stretches far and wide. When it’s closed, light becomes dispersed. It won’t go as far as the focused beam, but it’ll light the area in your near vicinity more than well enough so that you can clearly see everything in range. Foxelli calls the focused light ‘spotlight’ and the dispersed light ‘floodlight’. The spotlight goes about 100 meters or so. The floodlight goes about half that far. Personally, I strongly prefer the floodlight. The reason for this is that when I go with the spotlight mode, the beam shines upwards to much in order for me to be useful. I’d have to constantly hold my head down and my eyes up in order to see in front of me. Whether or not you will experience this problem as well, depends on the shape of your forehead, because the Foxelli MX500 is not vertically adjustable. If you have a sloping forehead like me, and you absolutely wanted to make use of the spotlight mode… then you’d have come up with your own makeshift solution by sticking something between the upper part of the headlight and your forehead, in order to correct the headlight’s angle when you’re wearing it. I personally do not take this effort. Even if the spotlight would shine straight out in front of me, then I still strongly prefer to have a wider light. In my opinion, it’s better to see everything within 50 meters clearly, then it is to see very little at a distance of 100 meters. But to each his own, I say. The options are available to you. By going with 5 lighting brightness modes and 2 lighting reach modes, Foxelli has managed to cram 10 lighting modes into one single headlight. I’d be lying if I said I wasn’t impressed. The MX500 weighs 4.5 ounces. There are other headlights out there which are far heavier. The weight that Foxelli offers on this headlight is totally acceptable. It doesn’t weigh you down at all. The strap is adjustable and will make it fit on everybody. It doesn’t matter whether you have a tiny noggin or a huge melon head. Me and my girl are in between and we managed to get them fitting fairly snugly, as far as a headlight can be snug on one’s head. If you want to increase your wearing comfort, then it is recommended you wear them over a winter hat or a work helmet. Depending on the situation in which you are planning on wearing the Foxelli MX500, this might not be an option. It could be that you’re hiking a trail in the summer. You are unlikely to want to wear a hat in the summer. But then again, summer days are long, and chances of you needing your headlight in summer are also less. I can say from my own experience that I wear my headlight most often in the wintertime, due to days being shorter and losing daylight earlier. On winter days when the daylight leaves me, I don’t mind putting on a winter hat and then wearing my headlight on top of it. It’s a great way to light your way and feeling very comfortable at the same time. Seriously… wear a headlight over a hat, and you’ll forget that you’re wearing anything at all. The camera’s flash is partly responsible for lighting up this dark garden scene. The brightest light in the middle is from the Foxelli MX500. I’m no professional photographer and this photo doesn’t do the MX500 justice. But trust me when I tell you that a Foxelli headlamp will light your way clearly! The batteries are integrated and USB rechargeable. The MX500 comes with a USB recharge cable. It’s so incredibly convenient to be able to hook this thing up to my computer while I’m working (typing this review, for instance). During my use of this headlight, I’ve switched lighting modes a couple of times. And I haven’t exactly been running around with a stopwatch to measure the battery life. So it’s hard to tell from my own experience exactly how long the light lasts. I contacted the Foxelli company to ask what battery life you can expect for the various lighting modes. They told me you can expect up to 100 hours of lighting in minimum mode. Go to ultra bright, and that quickly comes down to 8 hours. Make due with average mode, and you are likely to get 12 hours or more out of your MX500. And truth be told… average should be enough most of the time. So I personally judge the MX500 as lasting 12 hours in real life use. Intuitively, the 12 hour figure Foxelli gave me matches my personal experience, although I didn’t officially measure it. The batteries are integrated. You can’t put standard batteries in here. This means it’s no use bringing batteries with you. You’d have to bring an additional headlight if you need more than 12 hours of lighting. Or some sort of charging block that accepts a micro USB connection. You could charge them in place. The downsides to this is that you’ll be carrying the extra weight from the charging block, and that it takes time to do the actual charging. There’s definitely a tradeoff here. Do you want to be able to slowly recharge (cheap) or do you want to be able to quickly replace batteries (expensive)? One costs time, the other costs money. Which hassle do you personally prefer to put up with? It’s a personal decision, that will be influenced by a myriad of factors, such as the amount of time you intend to spend hiking in the dark. All in all, the Foxelli MX500 is a really great headlamp for a really great price. Depending on your personal needs, it may or may not become the favorite in your collection. But the fact is that at this price… it’s really hard to go wrong. You are guaranteed to get bang for your buck. A raving army of Amazon buyers can’t be wrong. An army I’m proud to have joined. Click Here To Get Your Own Foxelli Right Now! 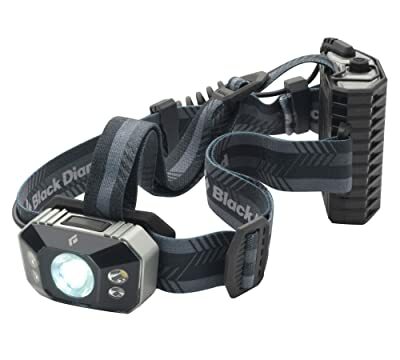 I have always had a fetish for huge flashlights, so when Black Diamond released the Icon 320 lumens headlamp I could not wait to try it out. And being the adventurous and passionate hiker that I am I could not resist the allure of the Black Diamond Icon’s 320 lumens. Admittedly, weighing 0.65 pounds the Icon headlamp is not the lightest headlamp out there. However, considering what this headlamp has to offer its bulkiness is a small price to pay, especially if you are a fan of headlights with high output lighting like myself. So what exactly are you getting with the Black Diamond Icon headlight? For starters, this Icon headlamp features an impressive quad power LED spotlight backed by two single power white LEDs and two single power red LEDs. These LED lights are capable of emitting 320 lumens, which is more than sufficient for night hiking. Also, the lights are powered by 4 AAA batteries. Amazingly, these batteries can keep the headlamp powered for up to 75 hours. This is something I found to be extremely useful since I am a fan of night hiking and early morning riding. Thus, although the headlight’s brightness reduces after about 14 hours of continued use, I found its brightness to be satisfactory. One of the factors I consider when looking for a headlight is ease of use. So one of the things I wanted to know about Black Diamond’s Icon headlamp was how easy it is to operate it. To my delight, it is incredibly easy to use. In fact, the Icon has to be one of the easiest to operate headlamps I have ever used. It has one large button on top of it. This button controls everything from brightness adjustment to changing light settings. This headlamp has six settings namely, maximum lighting, red night vision, dimming, robe, and lock mode. I found the control button to be easy to press even with gloves on. To shift from distance lighting to proximity or flood light all you need to do is click on the button twice. On the other hand, when you want to dim it, all you need do is press down on the button until you get your preferred brightness level. Locking and unlocking is also done using the control button. Pressing the button for six second locks the headlamp. To unlock it, push the button for six seconds again and release once the it lights. Despite it being heavy, this headlight is surprisingly light and feels comfortable when worn. Additionally, I found its harness system to be easy to adjust. This is in addition to it being durable. As if that is not enough, this headlight fits in almost all kinds of helmets. To crown it all, the battery compartment on the back of the harness system is well balanced with the unit. Thus, the battery compartment remains intact regardless of how rigorous you are hiking or riding. Being the outdoor loving and adventurer’s hiker that I am, I only go for headlamps that can withstand the extremities of Mother Nature. Thus, I was quite impressed and pleased with the fact that it is waterproof. According to the manufacturer, it can withstand being immersed in water up to 1 m deep. This combined with its robust plastic construction means that the headlamp can more than hold its own against Mother Nature’s wrath. Furthermore, since the battery compartment is also waterproof, you do not have to worry about this lamp going off on you on a rainy day. The Black Diamond Icon headlamp is powered by four alkaline batteries, which need replacing. Fortunately, though, it can also accommodate rechargeable Duracell batteries. However, in my opinion, the non-rechargeable alkaline batteries are the better option particularly for those of us who are never sure how long they will be away from a power source. With alkaline batteries I have found that I can always carry two extra pairs of batteries whenever I am going for long hikes, which is often. Thus, the fact that this headlamp does is not powered by rechargeable batteries is a plus for me. Extremely bright, in all honesty, this is the brightest headlamp I have ever used and I found it to be of great value when hiking along narrow rough trails in darkness. Amazingly comfortable, the battery compartment does not cause any sort of discomfort and does not cause any kind of itching. Excellent battery life, this headlamp can stay powered for up to 25 hours of continued use. It is waterproof, which makes it a great lighting companion for lovers of the great outdoors. It is durable; it has proven to be a tough piece of hardware. Is incredibly easy to operate. This headlamp is considerably bulkier and heavier compared to other headlamp models from the same manufacturer. Since it is powered by alkaline batteries, it is unlikely that it will be appealing to persons who are conscious about the environment. Though this Black Diamond headlamp is not the most environmental friendly one out there, it does have its perks. To begin with, the headlight offers unrivalled brightness and battery life. And although it has a larger battery compartment it is comfortable to wear. It comes with four Duracell Quantum batteries and a user manual, which you will only read once to understand how to operate it. It is capable of providing you with sufficient lighting for a distance of between 115 and 328 feet. 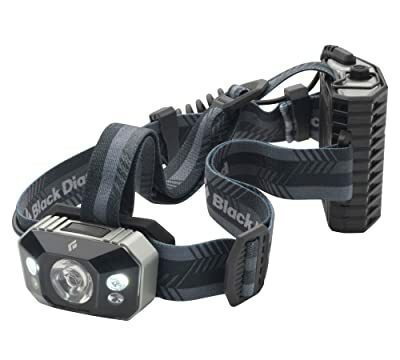 If you are still sceptical about this headlamp, Black Diamond throws in a three-year warranty. This headlamp is ideal for hiking, camping, climbing and mountain bike riding. In conclusion, this is an excellent lamp, which I highly recommend to any hiker, biker, mountain climbing lover, and camper. Although it is not devoid of drawbacks; it is one that I would not trade off for any other lamp. What Is Important When Buying A Good Backpacking Headlamp? I have tried out many different kinds of headlamps for hiking myself over the years. I definitely have a number of favorites amongst all the ones that I’ve owned and used. In this post, I will review all the best hiking headlamps for 2015. Headlamps are great for outdoorsy people like you and me. It’s great for running, hunting, climbing, mountaineering and ofcourse… hiking. A headlight is something that every person needs when he is going on a hike. You never know when you will find yourself in the dark. Once it goes dark, your risk of getting injured goes up, because you can’t see what you’re doing. You always need to keep one of these babies in your backpack. Because what if you stumble across a situation where you find yourself having to do something in the dark? Like… when you haven’t been able to make it to basecamp? It’s possible to get lost during a hike. You can also simply get injured and be slowed down. Now you’re forced to make camp, light a fire and set up a tent. How are you going to do that if you do not have a good hiking flashlight with you? By the way… when choosing whether to go with either a lantern or flashlight for hiking… don’t go with either. Go with a headlamp instead. You’ve got to have both of your hands free at all times. Otherwise it’s going to be really tough reading a map, setting up a tent, lighting that fire and roasting those marshmellows. The brightness of a lamp is measured in lumens. The higher your amount of lumens, the better it will light your way through the darkness. Most headlamps I’ve seen have multiple modes, meaning you can set it to low or high lighting. That’s really a great option to have, because you don’t need a lot of light in every situation. For those situations, you can set it low lighting and save lots of battery life. Which brings me to the following point! If you’ve ever had your smartphone run empty on you, then you know how annoying it can be. Just imagine how annoying it is when you are hiking and your light runs out. Sooner or later, your batteries are going to drain. But some headlamps have greater battery life than others. And this is one of the most important things to look at. Because if you’re carrying a headlight which doesn’t have any battery juice left, then all you’re doing is carrying dead weight. Also keep in mind that batteries drain quicker in cold environments. Don’t ask me about the physics behind this. A headlamp can have all the battery life in the world, but if it’s too darn heavy to be carrying around on your head all the time, then you are still going to wish you hadn’t even brought the thing with you. Your trekking headlamp may never be too heavy, or it will simply become cumbersome for you. You’ll find yourself taking it off your head all the time and pointing it into the desired direction with your hands. In this case, you may as well have brought a regular flashlight that takes up one of your hands. A headlamp’s user friendliness doesn’t stop at the fact that it’s a lamp worn on the head. You’ve also got to be able to adjust its settings fairly easily. Some lamps are hard to use when you are wearing gloves. So it helps to have buttons on there that are easy to press, even when you are wearing gloves. 3 What Is Important When Buying A Good Backpacking Headlamp?